The Social Engineering Framework is a searchable information resource for people wishing to learn more about the psychological, physical and historical aspects of social engineering. Please use the index below to find a topic that interests you. How can you protect yourself against common attacks? 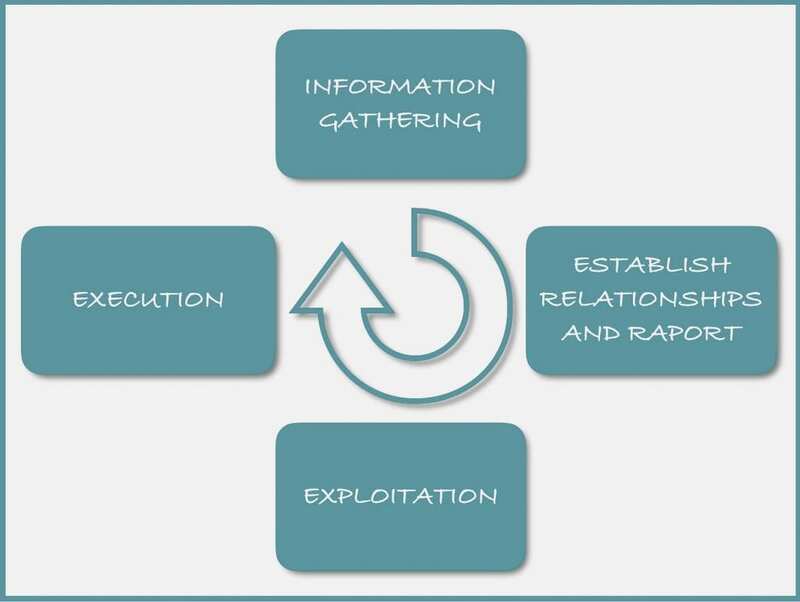 There is a predictable four-step sequence to social engineering attacks typically referred to as an attack cycle: information gathering, establishing relationship and rapport, exploitation, and execution. However, a number of factors can cause the cycle to repeat several or all of the stages for any given target. Depending on the nature of the attack and the target, the cycle can repeat several steps or even through every step multiple times until the attacker is caught, gives up, or is satisfied with the results. For example, an attacker may use a series of attacks to work their way to the target to achieve their goals because going straight to the intended recipient would likely fail. This is also known as a privilege escalation attack, making use of previously gained familiarity/referral from within the target company or exploiting information gained from previous interactions. The likelihood of success for most attacks depends on this phase so it is only natural to invest the majority of time and attention here. Information gathering techniques are elaborated in the Framework . Some of the information gathered is used to determine the attack vector, possible passwords, identify likely responses from various individuals, refine goals, become familiar and comfortable with the target, and formulate strong pretext(s). This phase establishes a working relationship with the target. This is a critical point as the quality of the relationship built by the attacker determines the level of cooperation and extent to which the target will go to help the attacker accomplish the goal. It can be as brief as hurrying towards the door with a big smile and eye contact so the target holds the door open for the attacker to walk through. It could be connecting on a personal level over the phone or as personal as showing family pictures and sharing stories with the receptionist in the lobby. It can also be as extensive as building an online relationship with the target through a fake profile on a dating or social networking site. Creating rapport is covered more in depth in the Framework. This phase is when the ultimate goal of the attack is accomplished, or for various reasons, the attack is ended in such a way as to not raise suspicion regarding what has occurred. Generally, it is not good practice to end an attack with the target questioning what just happened. Instead, it is better to leave the target feeling as if they did something good for someone else that allows possible future interactions to continue. This is also where any loose ends are addressed such as erasing digital footprints and ensuring no items or information are left behind for the target to either determine that an attack has taken place or the identity of the attacker. A well planned and smooth exit strategy is the attacker’s goal and final act in the attack.